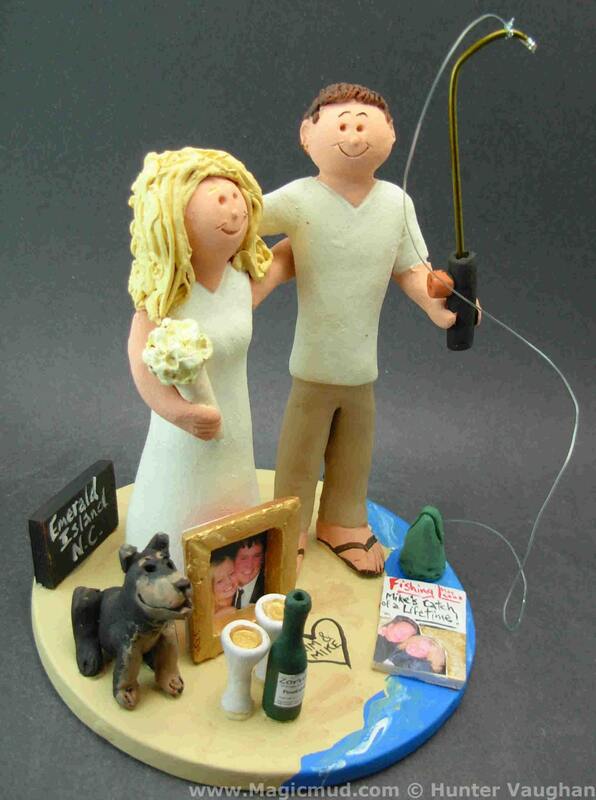 ...This photographed listing is but an example of what we will create for you....simply email or call us toll free with your own info and pictures of yourselves, and we will sculpt for you a treasured figurine for your wedding. 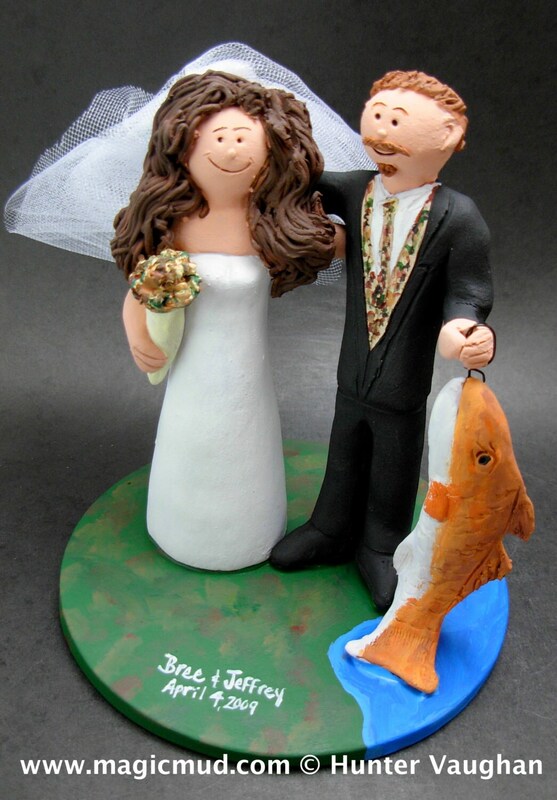 After all the energy put into the Wedding, crowning the Cake with a custom made fired clay caricature of Bride and Groom ensures a great response from all at the event, and a memorable heirloom of that most Special Day. Let us solve the problem of obtaining a most unique gift, a "personalized statuette" of the Couple incorporating their greatest passions,activities, interests,occupations, and so on. A miniature piece of art that will be treasured long after the Wedding Day commotion has settled down, and a reminder of that magical event in the years to follow. 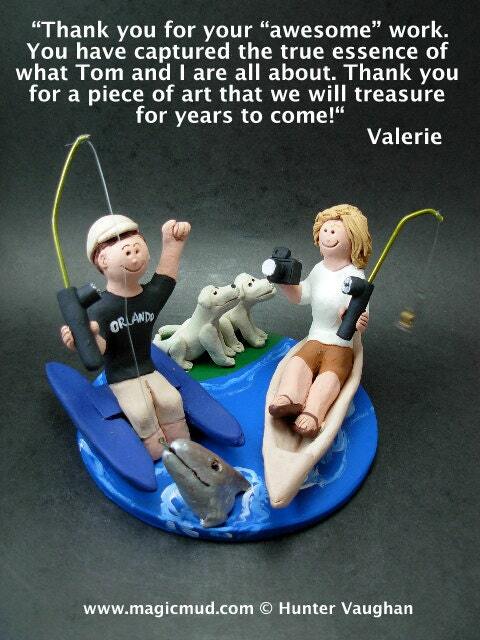 ...this is the fun and exciting way to create a one of a kind Wedding Gift. 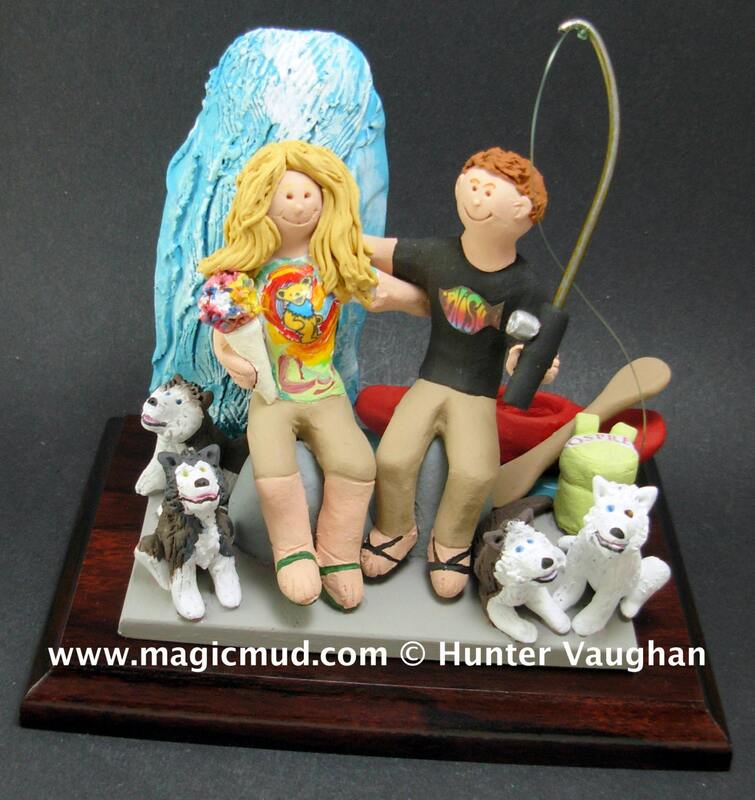 The Vaughans have been sculpting these figurines and an entire world of clay art for over 37 years, operating as Magicmud in Toronto, Canada. They specialize in creating what cant be found on any store shelf, and are proud of their ability to create solutions to the "gift giving" problem very quickly, and build to clients budgets. It is an old world art form with all of the creative process done entirely by hand. I am in AWE - successfully received our topper Friday....With total excitement opened it. WOW!!! The pictures you sent last week do NOT accurately represent the exceptionally fine craftmanship! Oh my word, you are so talented Hunter!!! As I shared before, it is a complete blessing to have stumbled on your website. Combination of throughly brousing your website, pics you sent of recent work, and speaking with you multiple times convinced me to invest in your work. I AM SO THRILLED!!! I can't wait to see everyone's reaction at our wedding....especially Robert's. 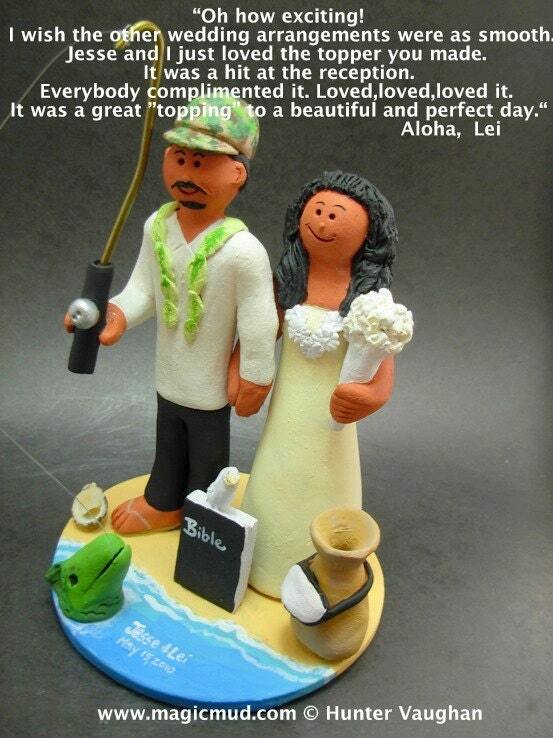 Remember, our topper will be a total surprise to everyone including my groom. I haven't shared with anyone...I love surprises. The best part is this is not a typical, plastic, mass-produced wedding cake topper to store in the attic after our joyous union! It's a treasure; a personalized family heirloom. As you confidently expressed your capabilities....you really did capture each of our personalities and character. It represents so much more than a decoration on our wedding cake...I think it'll mean so much to our children as we blend our families. In your masterpiece, you brought us to life as one, just as I hoped. It is really special!!! Oh my word, I am so pleased! THANK YOU!!!! Sorry to ramble, but your work deserves recognition. Have a wonderful day, week, month.....I'll forward action pics mid-October (post-honeymoon). THANKS AGAIN!!!! !